1 I am writing you with much concern after having read of your hearing to decide whether the alternative theory of Intelligent Design should be taught along with the theory of Evolution. 2 I think we can all agree that it is important for students to hear multiple viewpoints so they can choose for themselves the theory that makes the most sense to them. 3 I am concerned, however, that students will only hear one theory of Intelligent Design. 4 Let us remember that there are multiple theories of Intelligent Design. 5 I and many others around the world are of the strong belief that the universe was created by a Flying Spaghetti Monster. 6 It was He who created all that we see and all that we feel. 7 We feel strongly that the overwhelming scientific evidence pointing towards evolutionary processes is nothing but a coincidence, put in place by Him. 8 It is for this reason that I’m writing you today, to formally request that this alternative theory be taught in your schools, along with the other two theories. 9 In fact, I will go so far as to say, if you do not agree to do this, we will be forced to proceed with legal action. 10 I’m sure you see where we are coming from. 11 If the Intelligent Design theory is not based on faith, but instead another scientific theory, as is claimed, then you must also allow our theory to be taught, as it is also based on science, not on faith. 12 Some find that hard to believe, so it may be helpful to tell you a little more about our beliefs. 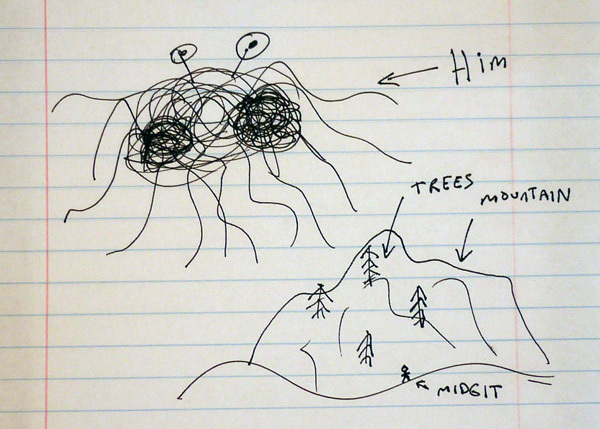 13 We have evidence that a Flying Spaghetti Monster created the universe. 14 None of us, of course, were around to see it, but we have written accounts of it. 15 We have several lengthy volumes explaining all details of His power. 16 Also, you may be surprised to hear that there are over 10 million of us, and growing. 17 We tend to be very secretive, as many people claim our beliefs are not substantiated by observable evidence. 18 What these people don’t understand is that He built the world to make us think the earth is older than it really is. 19 For example, a scientist may perform a carbon-dating process on an artifact. 20 He finds that approximately 75% of the Carbon-14 has decayed by electron emission to Nitrogen-14, and infers that this artifact is approximately 10,000 years old, as the half-life of Carbon-14 appears to be 5,730 years. 21 But what our scientist does not realize is that every time he makes a measurement, the Flying Spaghetti Monster is there changing the results with His Noodly Appendage. 22 We have numerous texts that describe in detail how this can be possible and the reasons why He does this. 23 He is of course invisible and can pass through normal matter with ease. 24 I’m sure you now realize how important it is that your students are taught this alternate theory. 25 It is absolutely imperative that they realize that observable evidence is at the discretion of a Flying Spaghetti Monster. 26 Furthermore, it is disrespectful to teach our beliefs without wearing His chosen outfit, which of course is full pirate regalia. 27 I cannot stress the importance of this enough, and unfortunately cannot describe in detail why this must be done as I fear this letter is already becoming too long. 28 The concise explanation is that He becomes angry if we don’t. 29 You may be interested to know that global warming, earthquakes, hurricanes, and other natural disasters are a direct effect of the shrinking numbers of Pirates since the 1800s. 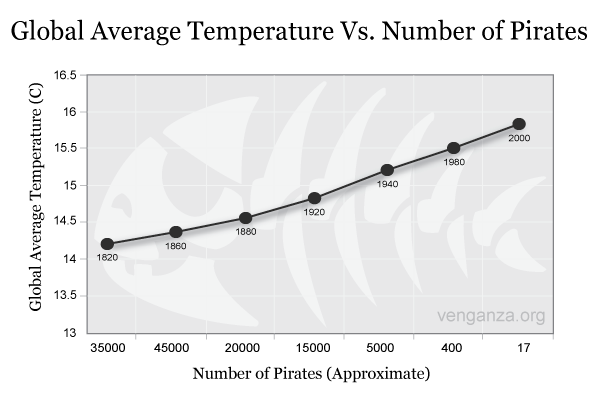 30 For your interest, I have included a graph of the approximate number of pirates versus the average global temperature over the last 200 years. 31 As you can see, there is a statistically significant inverse relationship between pirates and global temperature. 32 In conclusion, thank you for taking the time to hear our views and beliefs. 33 I hope I was able to convey the importance of teaching this theory to your students. 34 We will of course be able to train the teachers in this alternate theory. 35 I am eagerly awaiting your response, and hope dearly that no legal action will need to be taken. 36 I think we can all look forward to the time when these three theories are given equal time in our science classrooms across the country, and eventually the world; One third time for Intelligent Design, one third time for Flying Spaghetti Monsterism, and one third time for logical conjecture based on overwhelming observable evidence. 38 P.S. I have included an artistic drawing of Him creating a mountain, trees, and a midget. 39 Remember, we are all His creatures.